Piriform, the creator of the popular CCleaner program, is releasing a new service called Agomo, which they had spoken about in a blog post a few months back. Agomo lets you monitor a remote computer from anywhere and clean temporary files, registry errors, and even defrag the hard drive. CCleaner has been an extremely popular and useful software for many people. 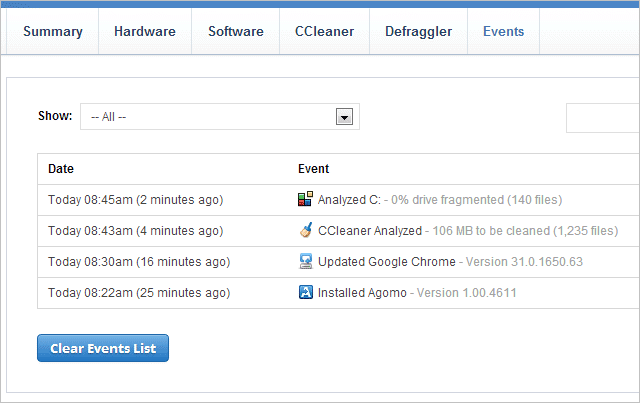 With Agomo, the process is even simplified for the masses by enabling access to the functions of both CCleaner and Defraggler from any location. In addition, the beta service you’ll read about below describes a feature to run Windows Update, remove programs, and even install particular software – all this is done from a remote browser. Follow along as we look at how to sign up for Agomo, how to add PCs to be monitored, and a glance over all the sections this service provides. 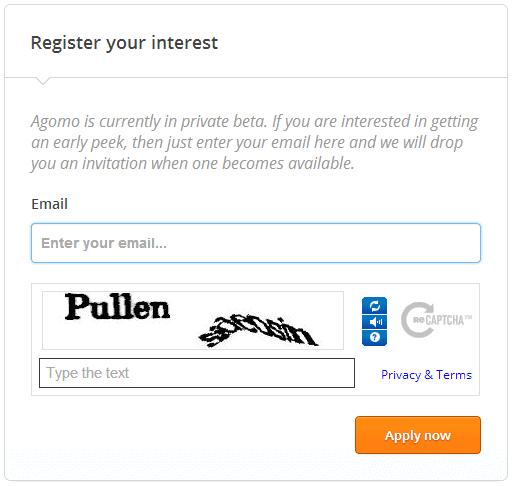 Agomo is currently in private beta, but you can request an invitation from the Agomo Sign up page. Fill out your details and wait for an invitation email to begin. It may take a few days or couple of weeks, or longer to get an invitation. By that time the public release may be available. The My Computers page is where you’ll find every computer you add to your account. Choose “Add Computer” to begin. The computer must run the Agomo Setup file. 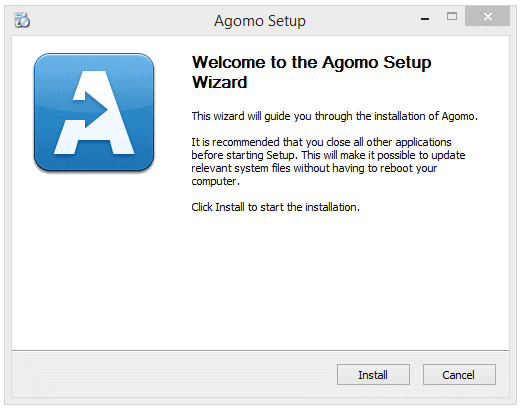 Get this file and run it on the computer that should use Agomo by clicking the “Download Agomo installer for Windows” button. There’s nothing to the installer but to simply click “Install.” The rest is automatic. 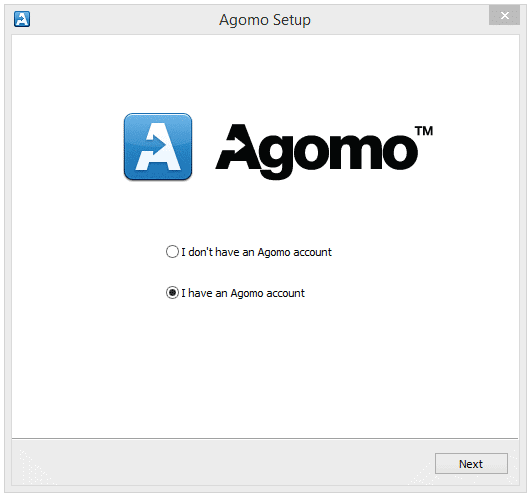 Because you must have an account to use Agomo, choose “I have an Agomo account” to proceed. Finally, enter your login credentials and then describe the computer so you can easily identify it from your account later. I’ve used “LAPTOP” because I’ve also included a desktop PC with my account. Click the “Login” button to finish up. These are the only necessary steps for adding a new computer to Agomo. You’ll receive an email saying you’ve added the computer. 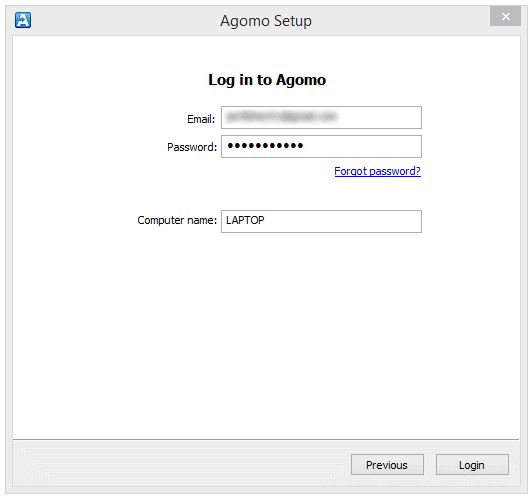 Sign on to Agomo from the Login page. 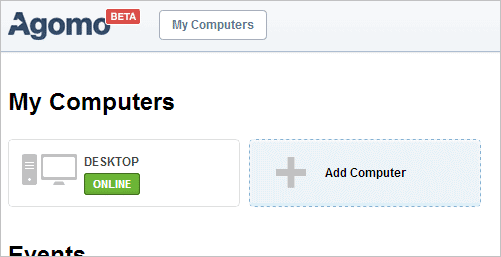 Every computer you add to your account will display on the main page, accessible from the “My Computers” button near the top of the page. Click a computer icon to begin using it remotely. After a quick automatic scan, you can see details on the hardware and software or run CCleaner and Defraggler from their own menu tabs. The “Summary” page gives a nice overview of important stats. For example, see the general OS and hardware details. 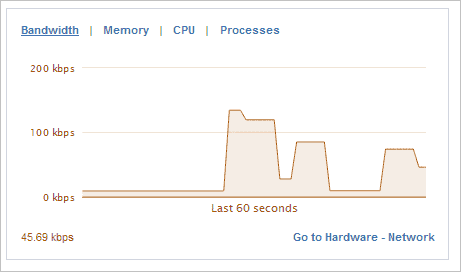 Scroll down a bit to see a bandwidth, memory, and CPU monitor as well as a list of the running processes. This serves as a remote task manager. Disk space usage/activity is also available from this page. 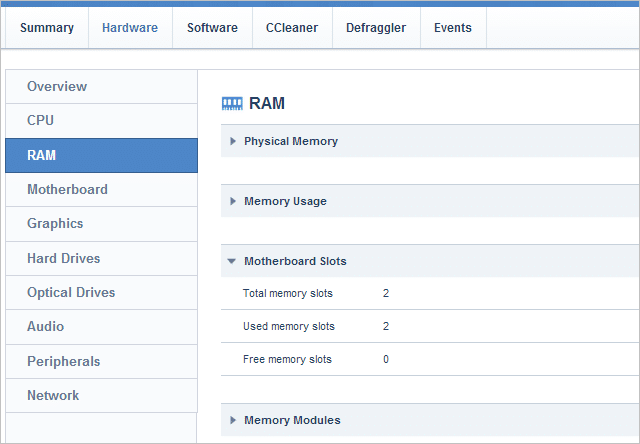 The “Hardware” tab has many sections for detailed hardware info. This reminds me of Speccy, also from Piriform. The “Software” menu tab is a really cool section. View running processes, manage startup applications by disabling or removing them entirely, and even control Windows Update remotely (this feature is yet to be finished but looks to be promising). Finally, you can even add software remotely from the “Add Software” tab. 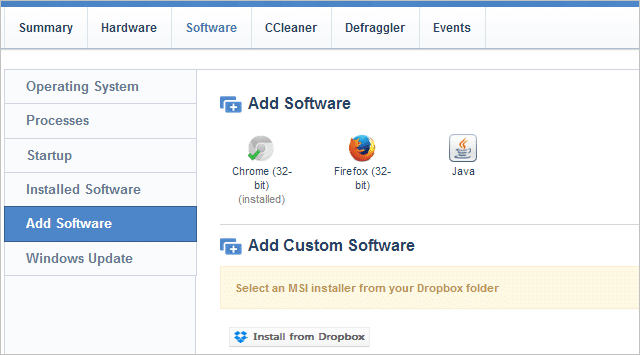 Not every installer file is supported, but Agomo has a few you could try it for the time being, like Chrome or Firefox. 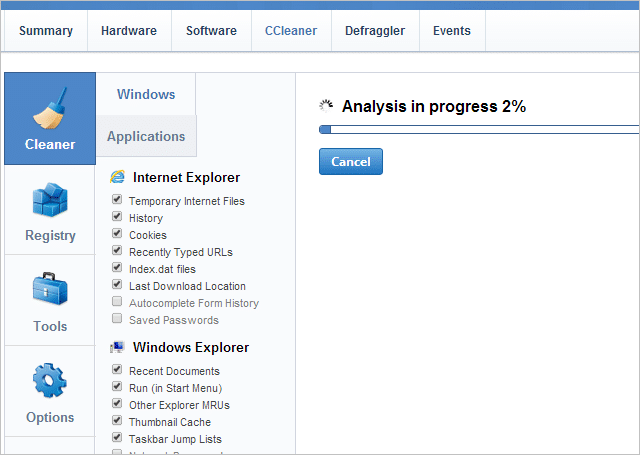 The “CCleaner” tab is just what it sounds like – CCleaner’s full functionality built-in to the browser. Clean up temporary application and Internet files, clean up the registry, and even remove System Restore points or run Drive Wiper like you can with the desktop CCleaner install. The “Defraggler” menu tab is quite simple, letting you analyze and defrag (quick, full, and defrag free space) the local disk drive. The “Events” tab shows all the events Agomo captures from the PC. Filter events from the “Show” dropdown menu if you have too many to view at once. To the right is an “Options” link. Click this to make CCleaner or Defraggler run on a schedule. Pick any time and reoccurrence detail to set up scheduling. 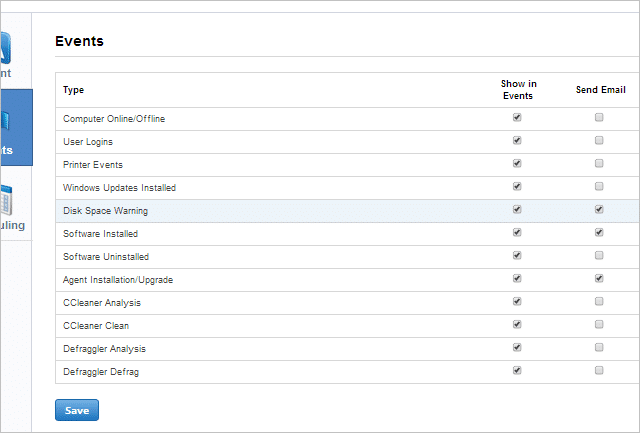 Choose the “Events” section of the same “Options” page to enable emails for certain events like when a user logs on or software is installed/uninstalled, and many other triggers. 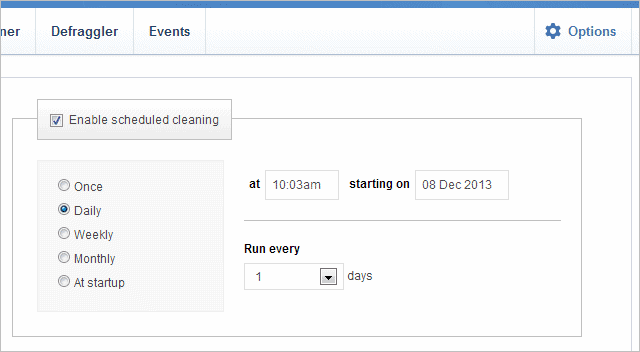 Enabling the scheduling lets CCleaner clean every user’s profile. With the kind of advanced features this service boasts of, I assume this private beta may turn into a paid option once it’s publicly available. Even if so, the ease of administration this provides is absolutely fantastic. 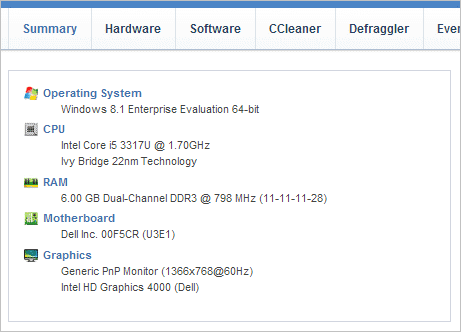 I would love to use this for the many computers I seem to clean up with CCleaner. Even if scheduling becomes a paid-only feature, being able to run the CCleaner functions remotely is impressive. I spoke with Piriform support and was informed they have “serious plans for mobile,” in the context of mobile clients for using Agomo. I’m very excited to see what else Piriform can pack into this service before it’s public release.